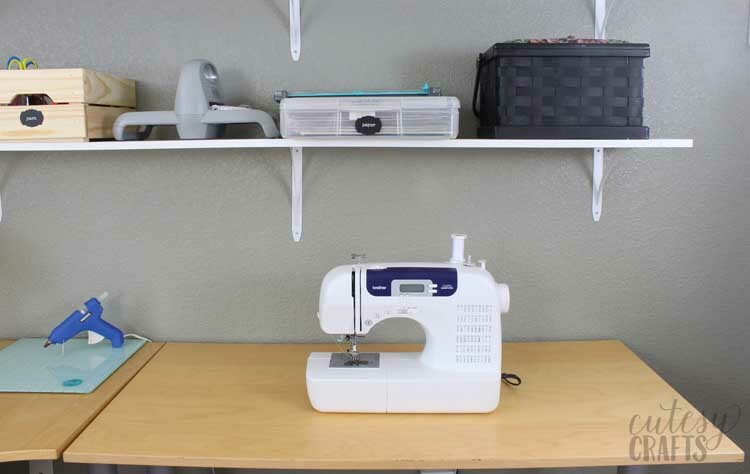 I was all excited to share my new craft room with you all until I googled “craft room ideas”. What in the world?! 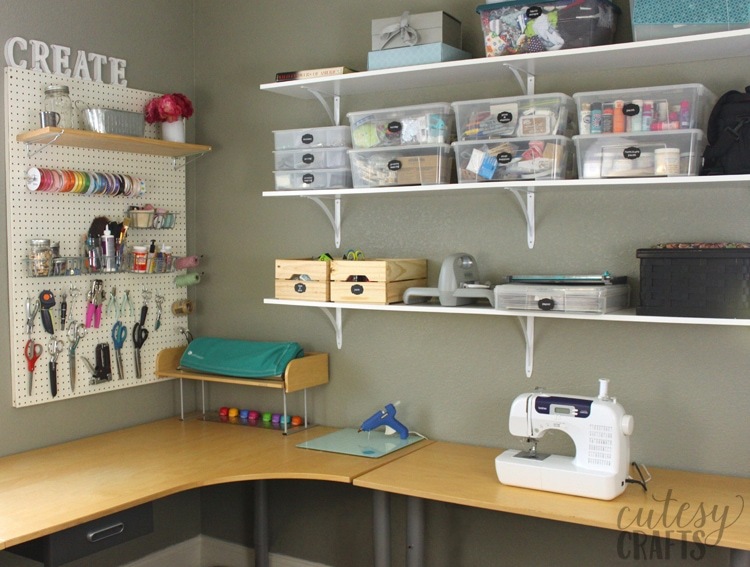 How do people afford to have these amazing craft rooms? Well, I’m still going to show you mine because it makes me so happy to finally have this space. 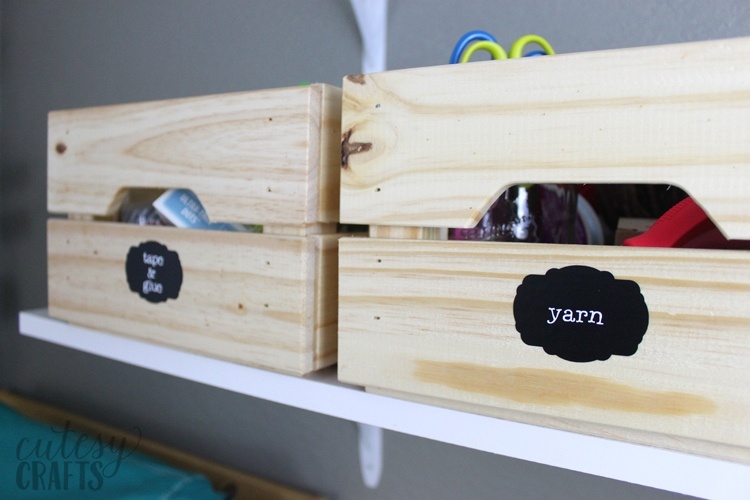 And maybe this will give you some craft room ideas that a normal person can actually do! I got this awesome L-shaped desk off craigslist. I believe it’s an Ikea galant desk that is not made anymore. There’s the main “L” section of the desk and two extensions. 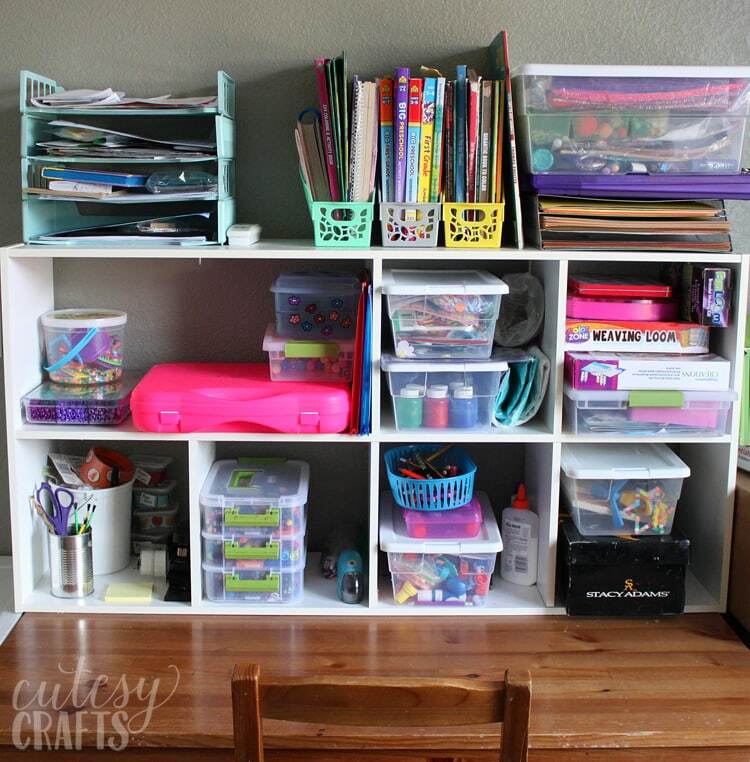 We also use the room as a homework area for the kids and office supplies, so having the desk in the corner like this saves a lot of space. So, if you’re searching for a desk for your craft room, do yourself a favor and check Craigslist first. Here’s the kid’s homework and craft area. I love that they have a space to make a mess, and I don’t have to worry about it! I used our old, small kitchen table and put a cube shelf on the back. It’s perfect! I get to have my sewing machine, hot glue gun, and my Silhouette out all the time! Dream come true! We set up these shelves on the wall, and they are the best! Can I give you some advice about shelving? Do not buy shelves from a place like Ikea or even shelving kits from the hardware store. 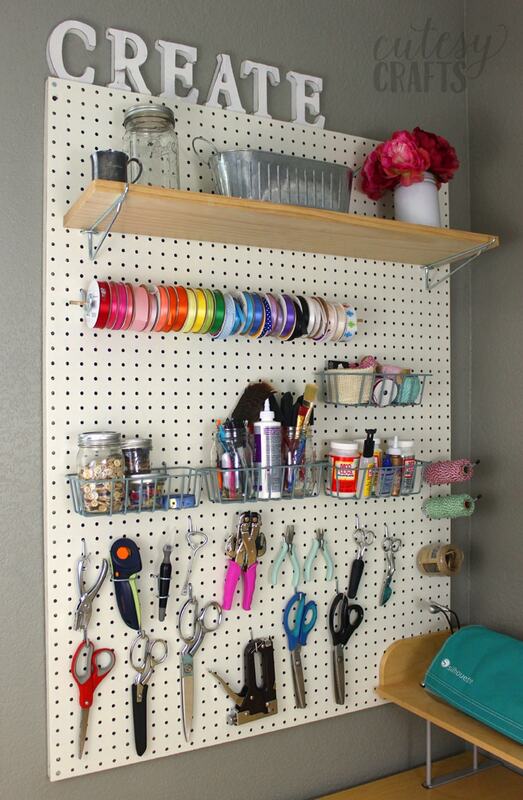 Instead, just go to the hardware store and buy brackets and laminate shelf boards separately. It’s much much cheaper and the same amount of work. You don’t even have to paint the boards because they come already painted. 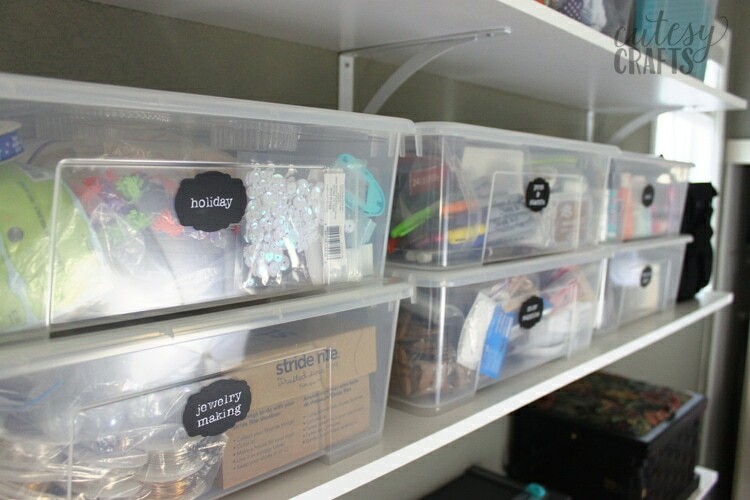 I got a bunch of bins to organize everything and made some vinyl labels. I wanted them to sort of look like chalkboard labels, so I layered white letters on top of a black label. 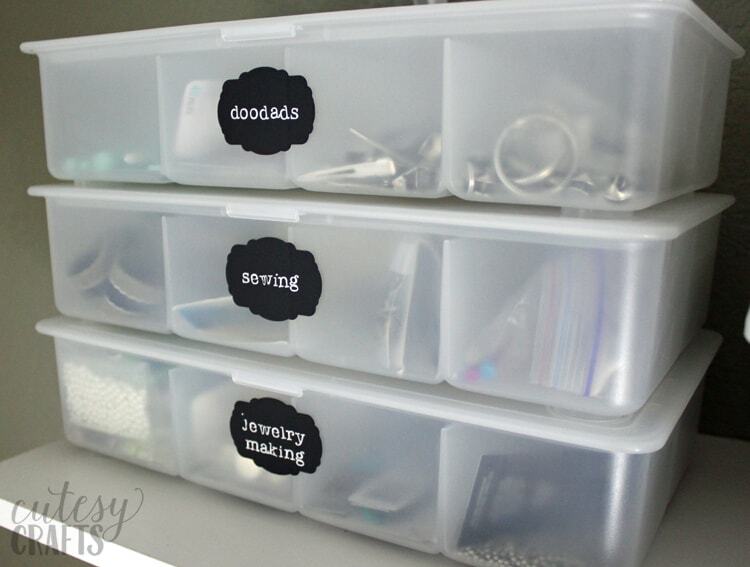 You can get the cut file for the labels here. My awesome hubby helped me build this peg board to put on the wall. 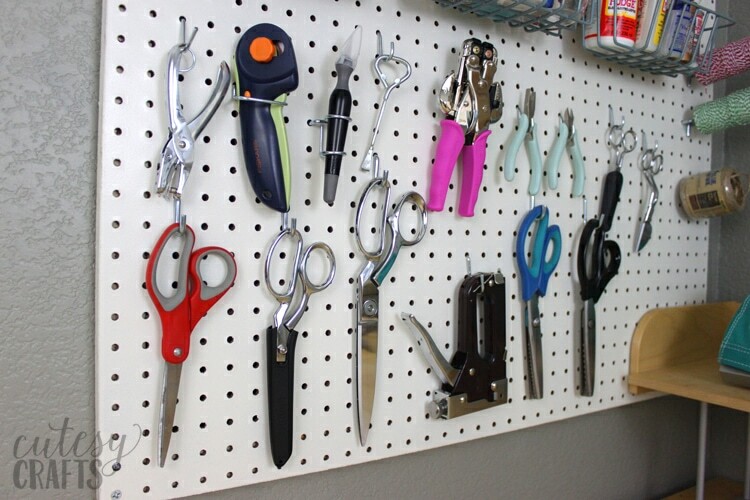 I didn’t realize that so much went in to hanging a peg board! First of all, it doesn’t even come painted. You have to prime and paint the thing. Then, you have to build a frame behind it to create space between the board and the wall. We did it though, and I love it! I was pretty ridiculously excited to hang up all of my scissors and tools. My mom bought all of the awesome fabric scissors for me for Christmas. P.S. – According to my mom, don’t buy fabric scissors at the craft store. Apparently they are much cheaper on Amazon. I got all of the hooks and peg board baskets at the hardware store. 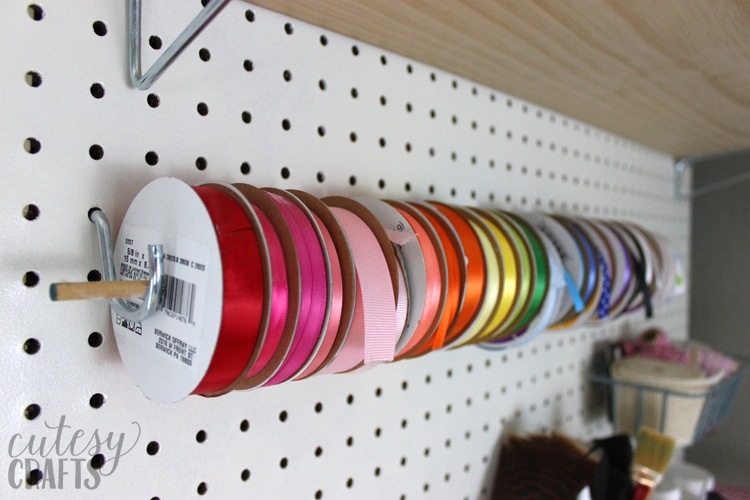 I used three of the pegboard hooks to hang a dowel for my spools of ribbon. 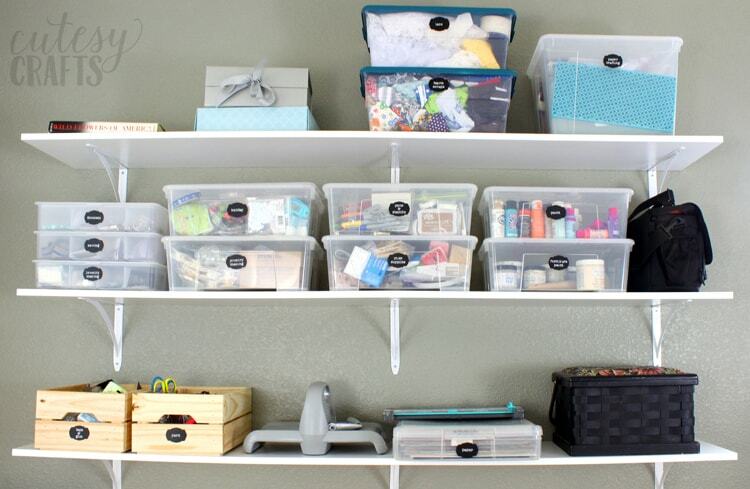 Much better than having it all crammed in a drawer. 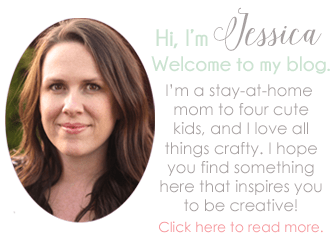 Do you have a space for your crafts? I’ve still got some fabric and things that need organizing. 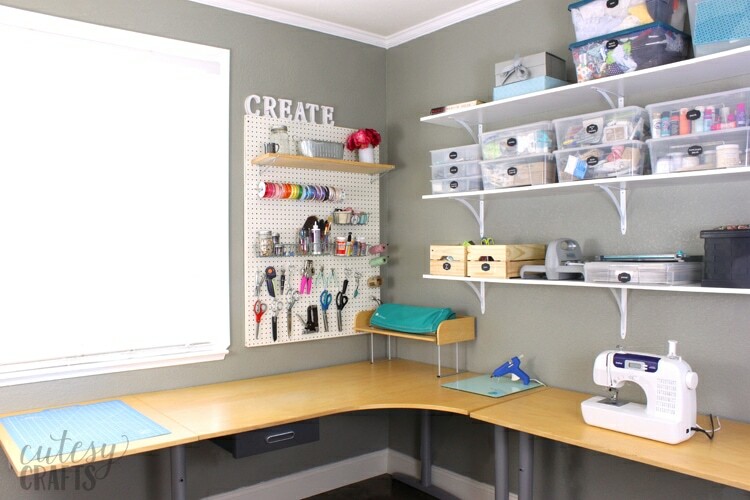 I’d love to know what craft room ideas you have used. Yes, I think that’s the best part, that I don’t have to put everything away! Before we moved, I used our dining table as my craft area, which could be seen from my front door. My house always looked like a mess. Haha! The attic sounds like the perfect place to keep everything. Great craft space there, this is something my father would appreciate as it is similar to his tool bench in his garage, great organisation.. Thank you! Yes, we have one in our garage for tools as well. I keep thinking I need a tool belt for when I’m working on stuff too. Haha! I’m always losing things.